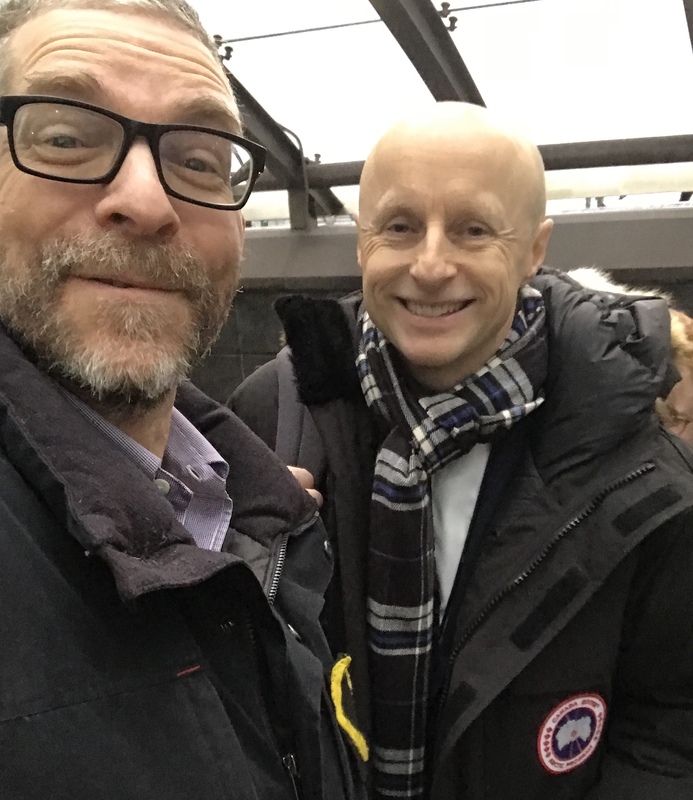 New York City Transit President Andy Byford dropped by for a session with WNYC’s Powerful Official Whisperer Brian Lehrer on Wednesday for a wide-ranging chat on transit service, fare hikes, Amazon and, of course, Gov. Cuomo (who chatted with Lehrer earlier in the week). Early in the interview, Lehrer mentioned reports that the MTA is not only preparing for a scheduled fare hike next year, but will undertake service cuts. Byford pushed back. He should probably be running the U.N.
Byford is a great diplomat. Even when given constant opportunities to complain about the MTA board, Gov. Cuomo or others, he takes the high road. Lehrer, for his part, tried to draw Byford into the latest controversy unleashed earlier in the week by Cuomo, who said he opposes a fare hike and that the MTA is rife with inefficiencies and waste. Lehrer even played a tape of Cuomo basically blaming the Cuomo-controlled MTA for everything, including its very structure. “I’m not going to interpret what the governor says,” Byford stated. “The way I look at it, I have plenty to get on with in terms of sorting out New York City Transit. We are doing something about governance at the MTA. We have task forces about procurement and the base cost of capital projects because people have rightly asked about those costs. New Yorkers don’t want me to get involved in the politics, but to get on with the nitty gritty … of moving eight million people a day. And most people most days are not delayed. And I salute the 50,000 people of NYC Transit who make that happen. When asked about Cuomo’s complaint of waste, Byford again kept his cool. “It’s easy to throw around comments like ‘waste’ and ‘inefficiency.’ I deal with data. We are continually looking to take out costs where we can. … My job is to run the place efficiently. … The MTA has delivered something like $2 billion in efficiencies in recent years. There undoubtedly is more to find [and] it is incumbent on us to do more. “We should leave no stone unturned,” he added, when Lehrer specifically asked about allegedly high-paid transit executives. “We are recipients of public funding and we need to make sure we are spending those dollars wisely. I am impressed by the work ethic of my colleagues. There is a perception that we are time markers. I don’t see that at all. In any organization of 50K there are inefficiencies … but people work very hard. “I am continually looking … to focus on what matters: The basics of providing safe, punctual and clean public transit,” he added. That said, he put a positive spin on Amazon’s plans to open a massive headquarters in Queens. “It’s good news that Amazon has confidence in the existing service that they chose to come here,” he said. The new signals on the 7 train will allow capacity to increase by two trains per hour, he said. And there will be similar improvements under Queens Boulevard, he added. “It’s all budgeted,” he said. Byford took over in January. Riders think the system is cursed. And ridership is down. Byford’s first course of action was stabilization and small improvements to show transit riders that things are moving in the right direction. He says he’s done that. “The three things I’m most proud of: within 100 days of my arrival, we put together … a vision, a road map to what New York really needs: fundamentally overhauling the infrastructure and the culture,” he said. “The thing that was missing was operational discipline, the nitty-gritty for getting it right,” he said, using a term he employed at least three times in a 20-minute interview. “In October, we delivered the best operating performance for three years on weekdays and four years on weekends. Track fires, down. The number of major incidents, down. For the second month in a row, the target I unilaterally imposed — 10,000 fewer delay incidents — was met. He admitted that most riders don’t see improvements yet. When Byford was asked about fare evasion, he brought up Manhattan DA Cy Vance’s decision earlier this year to stop prosecuting fare evaders — not that the rail-riding diplomat mentioned Vance by name, opting for extremely passive voice for his criticism. “The DA for Manhattan did announce that there would be a different approach taken to the prosecution of fare evasion. And that has had an impact,” Byford said. He declined to put a dollar figure on how badly NYCT is hurt by riders who don’t pay, saying he will make a full analysis available next month. But he did reiterate his commitment — and not just his personal commitment — to stopping fare evaders where Vance is failing to. “It’s only fair to the great majority of New Yorkers who do pay their fare. … We are certainly not being passive to it,” he said. So, fare evasion has gone up. Is that a good thing because it “helps the poor” or a bad thing because it destroys the transit system? You might not go to jail or receive a court summons anymore but you still get a fine. Are evasion stats up because there are more SBS routes with Eagle team enforcement? I guess we’ll wait for the full analysis, but he seemed to imply that fare evasion is up on the subway. Is CBTC running now 24/7 on the #7 line or isn’t it? I’m getting conflicting answers. One upside besides 2 extra trains per hour should be a speed increase. It would be fairly minor for the locals, perhaps just saving a few seconds per stop. For the expresses you should be able to shave a few minutes off the schedule. That allows you the one or two extra trains per hour without needing more rolling stock or TOs. Last time I checked (last Friday) it was operational between Main St and the 1st Ave Interlocking just north of Grand Central. When I do my annual trip to see Rockefeller Center I’ll take the #7 instead of the F just to see CBTC in action. In October, we delivered the best operating performance for three years on weekdays and four years on weekends. I assume Mr. Byford was referring the the 70% Terminal OTP metric which last saw that level in August 2015. What Mr. Byford failed to mention is that the average scheduled trip time was 2:01 longer in October 2018 than in August 2015. Much of the increased travel time was due to excessive dwell time within stations – not longer routes. The number of trips that had a stop single stop with a scheduled dwell time of 5 minutes or more increased from 4.1% to 9.4% of all scheduled trips. The number of trips that had an accumulated scheduled dwell time of 5 minutes or more increased from 8.4% to 19.8% of all trips. He has no use for reforming the labor structure of MTA. I don’t know what you mean by reform. But at NYCT titles were broadbanded, so workers couldn’t say “not my job” to work that needed to be done. Unlike, say, in city schools, workers who screw up bad enough can be and are fired. And some changes, such as FastTrack, have reduced the percentage of maintenance time that is spent getting there, setting up, and clearing out. Could there be more efficiencies? Sure. But I’ll bet you could find a lot more goldbricking elsewhere than at NYCT. In city schools, teachers who do something bad enough can be fired. Teachers just get due process, which means that, if you want to fire a teacher because they did something wrong, you have to be able to prove they did something wrong. Seems like common sense, right? I’ve never understood why they do this. If a teacher must be kept on the payroll until they get a hearing, and the DOE has nothing for them to do, just let them stay home. It’s silly to waste space which could be used for other things, not to mention sitting doing nothing all day is essentially like being in prison. It also shouldn’t take months or years to get a hearing. This day and age, it is very easy for a teacher to land themselves in a disciplinary hearing when they have done nothing wrong, because all it takes is an accusation. It is the DOE version of a police officer getting assigned to administrative duty. It is a delicate balancing act. As soon as an accusation is made, one in where the safety of children is at risk, that teacher needs to be removed from the classroom. For the sake of the children. But this is before any investigation is even conducted. This is before investigators even determine if the teacher was in school on the date that the accusation takes place. If a teacher were to just be fired the instant an accusation was made, then we would have no teachers. People love to blame teachers and the teachers’ union for the length of time these investigations take. But the reality is, they have nothing to do with it – they are being blamed for government bureaucracy as it is the DOE that takes that long. The union actually fights to get the hearings done sooner. See, in most jobs, a person accused of wrongdoing can be kept in the job while the company or government investigates in the background. But this isn’t the case for teachers. So what do you do, keep them teaching when they are a potential threat to students? Or fire them as soon as someone makes an accusation? Jeez, I know plenty of students who would have wielded such power to straight A’s all through middle and high school. Most accusations are unfounded anyway, but they take forever for the DOE to figure that out. Don’t bother. it already failed, before Day 1 was even finished. Ugh. It seems the MTA gets the worst of both worlds when it does projects. They’re very expensive and at the same time substandard. Failures might be tolerable, or at least understandable, if the MTA paid its vendors bargain basement prices. It’s totally unacceptable when we pay top dollar while getting third-world quality. Hopefully they’ll iron things out on the #7 so we don’t have a repeat on the Queens Blvd. line.